meet the "functional Unit" - Modularisation 2.0. Taken Emtunga's unique modular system to the next level, we are now modularizing the functions within the “boxes”. The new Classic modular system is based on several pre-engineered standard functions – known as Functional Units. These small building blocks can be arranged as desired to build your preferred layout. We have created off-the-shelf designs for all typical areas in offshore accommodation. The Classic Modular System comes in three different platforms (C2, C3, C4). Based on the widths of these platforms and by adding sections you can generate a layout that suits the required footprint. The Classic Modular System allows to combine the standard Functional Units with project unique, customer specified, units. This keeps the freedom to create layouts incorporating any function you can think of. Similar to traditional Emtunga designs, the Functional Units are enclosed by a stressed skin structure. 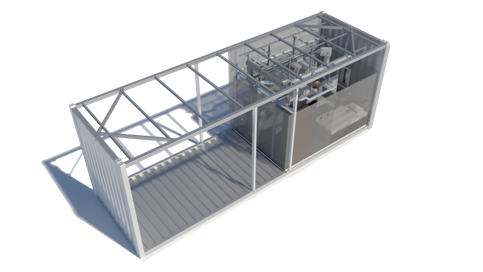 This modular section concept allows for a more flexible fabrication with parallel activities as well as pre-fabrication and assembly at different locations. To benefit the most from the Emtunga Classic concept we want to support early on in the project. Instead of extensive concept studies and FEED Studies, we can perform a gap analysis toward local regulations and applicable company or project specifications. After which you have a complete general design, with minimum hours spent on engineering, even before the start of a conventional EPC Contract. By utilizing the Classic concept the Living Quarters’ design can be managed as any other standard product, e.g. lifeboats, with design data in place from day one. With a mature design in place from the start the risk and uncertainty are significantly reduced. Cost for changes will be kept down,as a result of an earlier occurrence of design development and less changes along the way. Imagine starting the project with a fully designed Living Quarter at day One instead of a blank page, a full team of engineers and stacks of specifications and regulations. By utilizing the Emtunga Classic Concept a technical description of the living quarters are complete at day one. Based on the Emtunga Classic concept a single unit living quarters can be delivered, free on board at our production site, after 12 months. The execution model is based on our modular production line principle and consist of well established procedures and plans, with clear interfaces to the client, promoting a transparent execution of the project. Design and materials rely on Emtunga's over 40 years of experience in the industry and aims to deliver the most cost efficient design whilst still maintaining regional requirements and the high quality expected from an Emtunga product. A typical Classic project utilize a 80/20 design rule, 80% consist of pre-engineered content and 20% adapted to project. A higher degree of standardization means a lower total life-cycle cost. The high degree of standardization and experience from previous projects, gives us the advantage to foresee any need for maintenance work. Based on this unique knowledge we prepare a preventive service plan based on real historical data. We also know when it’s time for a greater face lift, in order to maintain a pleasant working environment and save money in the long run. Together, this gives you a comprehensive overview of future maintenance and service costs.